Spinning wheels with flyers are equipped with a wishbone-like flyer. This arrangement allows the wool to be twisted and wound upon a spool at the same time. 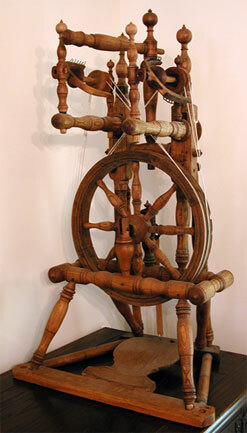 (On spindle wheels, spinners spin for a while then pause to wind the twisted threads onto the spindle.) 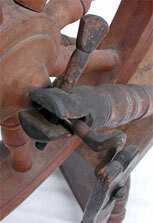 The hooks are used to spread the spun yarn across the bobbin. 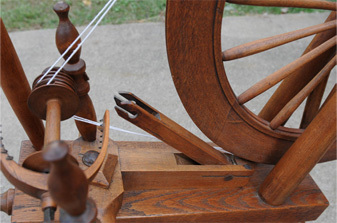 The spinner moves the spun thread from hook to hook as the bobbin fills. This concept is considerably more complicated than the plain spindle, as it requires that the spool and flyer rotate at different speeds whilst rotating on a common axle. This design surely evolved following the spindle. Turning two wheels at different speeds which are mounted on a single axle is performed by two pulleys having different diameters or by applying a friction brake to the flyer or the bobbin. For this flyer, it can be seen that the spool's pulley is smaller in diameter than the pulley that rotates the flyer. This difference causes the bobbin to rotate at a faster speed. Designs of wheels was determined in part due to the floor space that was available in the cabin to park the item. This little upright wheel has a footprint that is about as small as could be engineered. Yet the wheel seems to have nice balance and proportions. This wheel was found at a flea market. It appears to only be missing a distaff (not uncommon in older wheels). The seller said it had come from Germany around 1900 when the family immigrated to America. 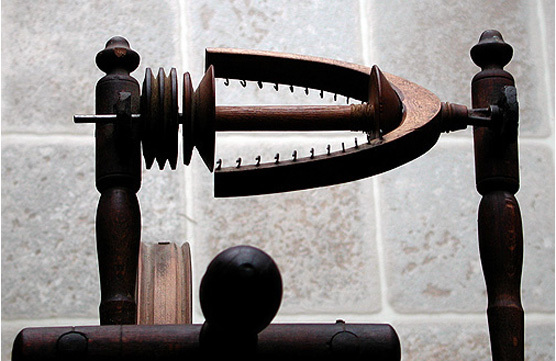 Spinning wheels are like many things--form follows function. The wheel above is a representation of this concept. It is a spinning wheel with a flyer--not a spindle. It is designed for spinning long fibers such as flax. 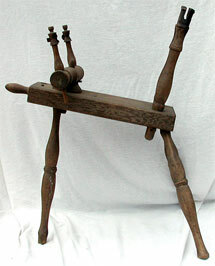 It uses a foot operated treadle instead of a big wheel turned by hand. 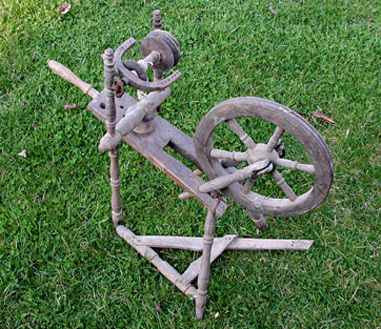 Use of a treadle enabled the spinner to use both hands to feed material into the flyer. The flyer is mounted at a convenient height for the seated spinner. This wheel is anything but a form-follows-function wheel. It is embellished to the max! There are three floating rings below the flyer and one ring on each of the short turnings on the wheel. The wheel has a clicking sound as it is used. It probably sat in some proper lady's parlor and she would while away the hours forgetting problems of the day as she concentrated on twisting together only two strands of flax. 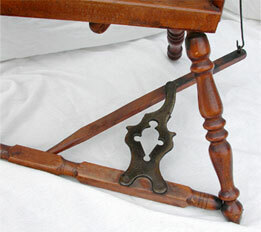 The metal parts used on the treadle (hallmarks of a Canadian Production Wheel) are designed for extended periods of use. 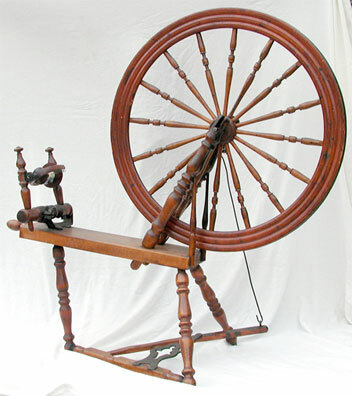 Many spinners prefer to remove their shoes while treadling to better "feel' the treadle. This metal treadle is obviously not designed for a bare foot. Metal parts are used on the drive belt tension adjustment to provide a positive and long-lasting tension. This is another upright wheel. These wheels are often referred to as castle wheels perhaps due to their appearance. 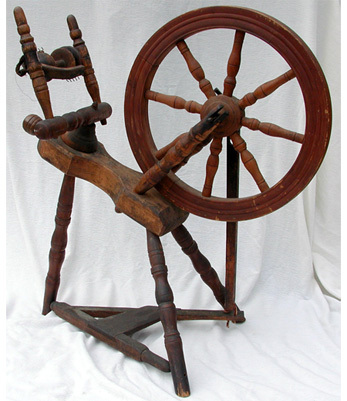 With this wheel the spinner is seated to the side of the wheel and the fiber fed from the left. 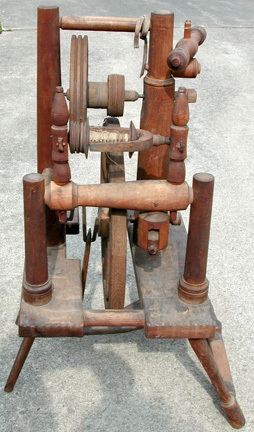 Compare the treadle and footman positions to the above upright wheels. This is an unusual double-flyer spinning wheel. We found it in Salt Lake City, Utah. It was believed that production could be increased if the spinner could keep two flyers going and feed them both at the same time. While this may work for a short time, quality of yarn deteriorated as both hands seem to work best when controlling the flow of fibers into the flyer. 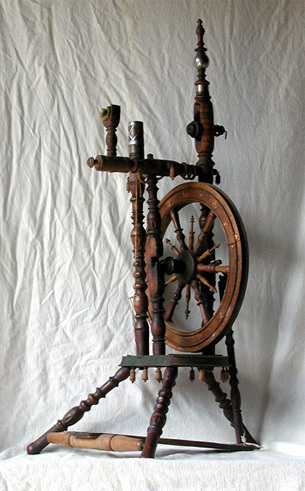 It is also more tiring to treadle a double flyer as the flywheel is small. 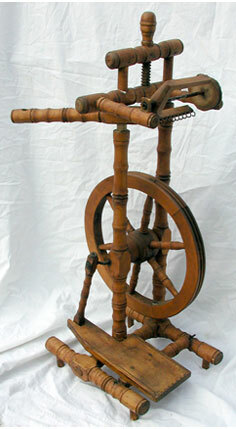 Double-flyer spinning wheels are often mistakenly called gossip wheels. 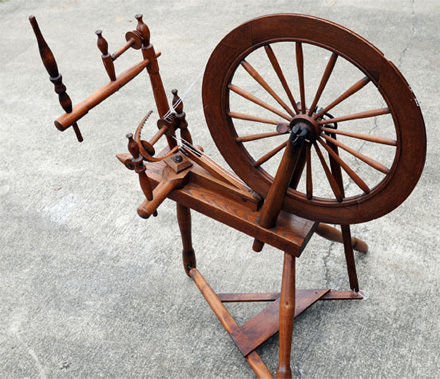 It is claimed that two spinners can sit side-by-side and spin and gossip. 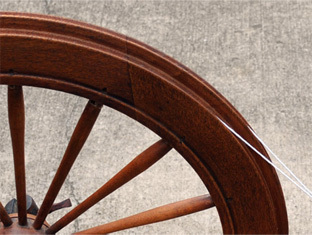 This signed wheel carcass was given to Elizabeth by Walden Roush, founder of the West Virginia State Farm Museum. As a boy he found this part in the local dump. He said that they couldn't find the wheel or flyer. The maker of the wheel was J. Kipp. 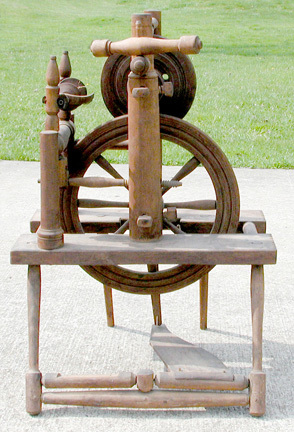 Based on the information we received when we purchased this wheel, we suspect that this is an early Pennsylvania flax wheel. It is the only flyer wheel we own where the flyer does not have screw threads for the flyer pulley. It is a friction fit. The finish is original and the only modification we will make to this wheel is to replace the disintegrated leather bearings for the flyer. The image at right shows hand-carved pegs which hold the drive wheel in place. Installed they keep the wheel steady when operating the treadle. When they are removed, it makes it possible to break down the spinning wheel for transport. The builder of the wheel also added a nice touch to the top of the footman. This little wheel has a fiddle-back base. It lightens weight while providing strength where needed. The narrow waist also adds a touch of elegance. The chair wheel gets its name because its base resembles a chair. This wheel incorporates an accelerating wheel which significantly increases the flyer speed. Alignment of the wheels and drive belts can be seen below. Note that two separate drive belts are required and both must have a means for drive band tensioning. This was one of those lucky finds. Elizabeth and her Mom were out on a Girls Day Out jaunt and stopped at an antique shop. Elizabeth noticed the wheel on display, but when first seen, the wheel had no flyer and had a walking wheel spindle installed. Deciding that it was priced to high, she pointed out to the owner that two wheels had been combined. The owner said, "Oh, I have some other things that did come with it, they are in the garage." He returned with a pristine flyer half loaded with old spun flax. A few minutes later Mom's car was once again converted to a textile tool transportation device. 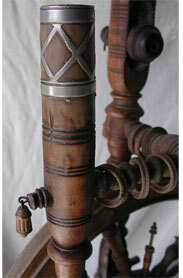 The missing distaff and treadle can be easily manufactured in the home woodshop. Our "basket case" appears to have spent the past decade or two in grandpa's barn. 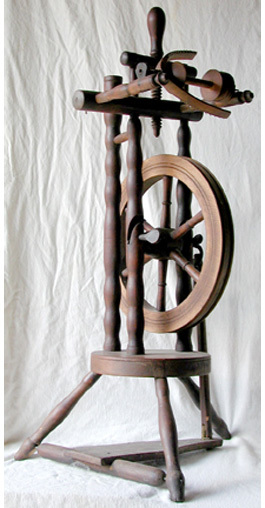 It is probably an Eastern European flax wheel. It was purchased at the Murphy Flea Market in North Carolina. There is a piece of bailing wire holding the frame together on the foreground front leg, someone added a tensioning knob that doesn't work, and most of the flyer pulley is chipped away. It looked like it needed a friend. The wheel is currently disassembled and in a box waiting repair. This is one of our latest wheel purchase. It was picked up in an antique mall on I-70 near Springfield, OH. The reason we wanted to add this wheel to our collection is because we didn't understand it. First, this is our only wheel which has two grooves on the wheel with different diameters. This feature seems to drive the spool and flyer at different speeds. The two grooves are shown in the image below. The image above shows the second unusual feature of this wheel. Purpose for the arm between the wheel and flyer is unknown to us. It does not appear to have a function when spinning. 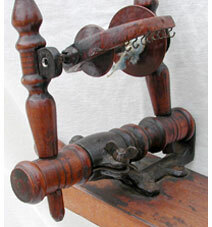 We were wondering if it might be used for bobbin winding or plying?